Let’s face it, dental bills are expensive. It’s not uncommon for fillings to run $300, root canals to cost $1,000, crowns to cost $1,500 and braces to cost over $5,000. Of course for those of us who do suffer from tooth pain the cost is almost always worth it, the problem is sometimes you just don’t have the money. For low to moderate income earners medicaid doesn’t cover dental services, and even dental insurance programs offered through employers tend to be extremely limited. Finding options to save money on dental bills in imperative to ensuring you keep your teeth in good health. Prevention is of course the best way to save money on dental care. Brushing twice a day and flossing is essential to keeping teeth in good shape. I read recently that flossing daily can add 8 years to your life! A routine check up costs around $50 – $100 and is needed once every 6 months. By having routine check ups problems can get fixed early on and cost a lot less than if you wait until you are in severe pain. Cavities on a single tooth surface may cost around $100 to fill, but if the cavity expands to multiple surfaces the price can cost up to $400. Although Medicaid does not cover dental expenses for adults, Medicaid does cover dental expenses for children. The Obamacare program instituted a minimum of 133% of the Federal Poverty level as a guideline for medicaid qualification. This amounts to $33,383 for a family of four. This is also based on Adjusted Gross Income and not total gross income, and individual states can elect to have a higher percentage of the Federal Poverty Level as their requirement for medicaid. For parents with children who are covered through medicaid it is a good idea to get any problems with their teeth fixed before they loose eligibility by reaching age 18, or before their AGI gets them just above the cut off. Even if you do not qualify for Medicaid, the CHIP program (Children’s Health Insurance Program) may provide free or discounted dental services for your kids. In Michigan the CHIP program is called MiChild and is for families with an AGI of up to 212% of the federal poverty level, which would be $53,4212 for a family of 4. MiChild costs only $10 per month and covers all children in the household. The Delta Dental program in MiChild covers 100% of necessary dental expenses up to $1,500 per person per year, braces however are not covered. Health Savings Accounts are a great way to save money on dental bills. Dental expenses are a qualified expense for HSA’s so funds in your HSA can be used tax and penalty free. For a family in the 15% federal tax bracket this amounts to a 15% savings on federal income tax, and a 4.25% savings on Michigan income tax. I have been using my HSA to pay for dental expenses for the last two years and have had no problems with it. I just found out about this earlier this month. My dentist mentioned to Mrs. C. that if we got this card we could save a bit of money on a crown she needs. The card costs $105 for a family membership for a year and just on her crown would save us $338, that’s a no brainer right there. Apparently insurance companies have found that by selling a discount card they can essentially expand their customer base to include people who don’t have insurance offered through work. The card allows individuals to take advantage of discounted rates that the insurance companies have negotiated with providers to be in their network. The card also will save us around $50 for fillings and $20 for check ups. Every dentist’s fees will vary and the cards they accept will vary too. I bought the Vital Savings card from Aetna and am thrilled that it has already saved me over $200 in just one visit. For $20 more there is an option to get a prescription drug savings card with it. So far I have had extremely low costs on the prescriptions we need thanks to the free discount card I have, but for some people with different medications, this may be a good buy. Be aware that when buying a discount card to get it directly from the provider. There are multiple websites selling the exact same card for over $50 more per year. In addition to shopping around for base prices, see what discount cards different dentists accept and what their discounts offered are. Just because my Dentist offers a crown at around $1,000 after discounts doesn’t mean that a dentist down the street or two states over won’t do one for $500, or charge $1,500 for one. In addition to shopping around for lower prices, also shop around for opinions on necessary care. One dentist may feel that a root canal and crown is needed, while another dentist may be able to fill a tooth without requiring a root canal and crown. This could be the difference between a $300 tooth and a $2,000 tooth. Most employer insurance only pays for a certain amount of work per year, usually around $1,000 – 2,000 per person. It is important to know what exactly your plan provides and to take advantage of it as much as possible. Although Mrs. C. was part time and did not qualify for medical benefits from her former employer, they offered a plan that covered up to $1,500 per person per year. They would pay 100% for preventative care, 75% for fillings, and 60% for major work like crowns and root canals. I wonder how many people never use these benefits because they just don’t want to go to the dentist. It’s easy for decay to build up and once you are in pain there may very well be more work needed than what insurance can cover. If this is the case, prioritize and do the work over multiple years, while using some of the other strategies outlined above. I am not a fan of credit cards, but necessary dental work is certainly something worth financing if you don’t have the cash to cover it. Dental financing can be extremely expensive. Ideally if you have a low interest credit card, finance dental work with that rather than taking in house financing. In house financing will tend to have higher interest rates and/or be a credit card with some “gotchas” attached. For example, a friend of mine went to have her remaining teeth removed and dentures fitted, a $6,000 procedure, and the financing option in house was at 21% over 5 years! Some of the credit card offers that providers may suggest will offer 0% interest if paid off in 12 months. Wait an extra day to pay them off and interest is charged retroactively at a high rate. This is why I suggest using your current low interest credit card if financing is needed. I would rather pay a 10% APR finance charge than risk high retroactive charges. 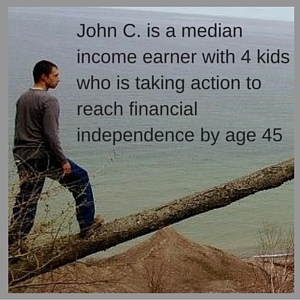 Following the above strategies has saved me hundreds of dollars on dental bills. 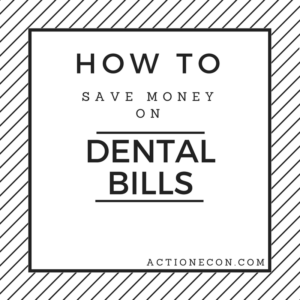 What strategies have you used to save money on dental bills? 2 Responses to "How To Save Money on Dental Bills"
My parents spent a hundred of dollars for my teeth. And now that I have a daughter, I’m hoping that I will not spend a hundred of bucks for her teeth too. I really appreciate your tip to have a regular dental check up in order to prevent larger problems from occurring. Going to the dentist for regular cleaning services can help you identify potential oral health risks so that you fix them ahead of time. I personally would rather deal with a cavity right away before it gets worse, because the longer you wait the more money you have to spend.